MUST READ: How is this even possible? Lori Lewis does it again. An employee with Jacobs Media, she writes about Social Strategy in a column called Merge, seen (bi? )weekly on All Access. Now, I should say that I already find it fascinating that she is able to come up with fresh, engaging content, 52 (or is it 104??) times per year, on essentially the same subject every time. I mean its not literally the same but basically its Facebook and Twitter for radio people. I don’t mean to break it down in a nagative way. Read her work. I have much respect for the type of knowledge she passes on and the manner in which she passes it. This latest article was great, well written, great strategies etc. BUT when I got about half-way down I couldn’t believe what I read. I am not really a huge social media guy, but I use it and I have launched national products and securing your BRAND on various sites and services is(should be) second nature. The last thing you want is to create a new NATIONWIDE BRAND on which you plan to position ALL OF YOUR COUNTRY STATIONS and NOT secure the twitter handle!! 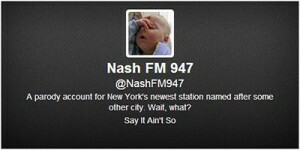 If you don’t, you are left with the flagship username looking something like this “@NASHFM947NY.” Is that an 11 character twitter name? Is it really letters followed by numbers followed by more letters??? I won’t berate the creator personally but as a jock think of having to say that on air over and over, unless you just ignore twitter altogether. Or maybe you the Brand Manager are not worried because you wont ever need to give the local twitter handle because you wont ever have an actual ‘local’ jock on air….in NEW YORK CITY….maybe all that is true. To find out, I went to Twitter’s sign-up page anyway to act like I was going to create the @NASHFM947 handle. I really thought that this is where Twitter would inform me that name was already taken and there would just be some weird technical glitch for not being able to find it in search. Think about the damage a competitor could have done with this. How is that even possible??? Congrats Lori. She is @lorilewis, I am @rdrean. Don’t even try and steal our handles because we got them before we advertised them to the world.